As Erik has pointed out, it is an excellent thing that political pressure from activists has shifted the Democratic Party leftward on major issues like single-payer health care. However, every advance brings with it new complications, and here the new complication is that not every new convert is always acting in good faith – which requires new tactics and strategies from activists. For example, you might well have new converts who claim to be for your issue when they think it won’t ever come up for a vote, and then walk sideways on you the moment that it does. Thus, activists need to keep up pressure and hold electeds accountable for delivering on public policy. Or to take another example, you might well have new converts who’ll claim fidelity to the broad concept of your issue, but who then twist the policy details to produce a far more conservative outcome. Case in point: Andrew Cuomo and free college for all. For those of you who aren’t higher education policy wonks or New York City-specific political wonks, a quick bit of background: after the 2016 elections, nominally Democratic Governor Andrew Cuomo wanted to shore up his left flank after a long period of shivving the left whenever he could. Having observed Bernie Sanders’ improbable levels of success in the Democratic primaries, he decided to pick one of Bernie’s signature issues – in this case, free college – and announce a brand new “Excelsior Scholarship” that would provide free tuition at New York public universities for families making less than $125,000 a year. 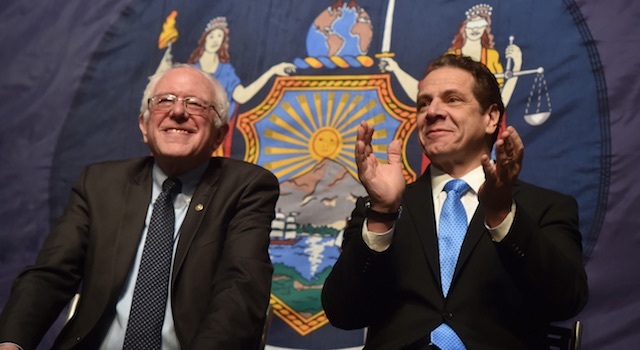 And Cuomo being Cuomo, he made damn sure to invite Bernie Sanders to the announcement so that he could use the photo op down the road. “that 210,000 number includes 165,000 students receiving federal and state assistance who did not apply for Excelsior. Another 23,000 applied for Excelsior and learned that they in fact qualify for a pre-existing state or federal scholarship, like TAP or Pell. “Students are required to live and work in-state after graduation for two or four years. Otherwise the grant reverts to a loan. This is vile. There may be justifications for post-graduation residency to ensure that the public of New York benefits from its contributions to public higher education; there may be justifications for requiring students to take a full-time course load to graduate, since they don’t have to work to pay for school (although I would personally argue that until the Scholarship includes the full cost of education and living expenses, that’s not the case). But there is no justification for taking back a public grant and turning it into debt to be used to punish students who don’t comply with unreasonable expectations…like having to carry an above full-time course load because Cuomo thinks students aren’t working hard enough. I wish I could say that this kind of chicanery is brand-new or limited to just people like Cuomo. But in fact there are a lot of “free college” plans put forward by liberal institutions that fall short of both the spirit and the letter of what free college means. For example, the University of California’s Blue and Gold program, which is supposed to cover all educational fees for eligible students, relies heavily on counting outside aid as U.C aid, eliding the difference between grants and loans, and then putting increased demands on stuent’s and families to contribute their earnings, their savings, and further debt. The point is: just because someone who wants to be a Democratic presidential nominee says they’re for “free college” doesn’t mean we can take them at their word without interrogating the details. We have to apply the same kind of pressure that shifted “single-payer” from a fringe position to a requirement for running for president to every last clause and subclause of the eventual legislation. That’s going to require a lot more work. And it’s going to require new forms of cooperation between grassroots political activists who can apply pressure to electeds and candidates and policy wonks who can do the deep dives to let those activists know whether electeds and candidates are living up to their promises. But ultimately, if we really want a revolution in fact as well as in name, we’re going to have to put in the work. Oh, and never, never trust Andrew Cuomo.